Dubrovnik Airport (Croatian: Zračna luka Dubrovnik; IATA: DBV, ICAO: LDDU), also referred to as Čilipi Airport (Croatian pronunciation: [tʃǐlipi]), is the international airport of Dubrovnik, Croatia. 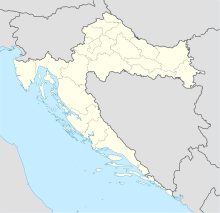 The airport is located approximately 15.5 km (9.5 mi) from Dubrovnik city centre, near Čilipi. It was the third-busiest airport in Croatia in 2017 after Zagreb Airport and Split Airport in terms of passenger throughput. It also has the country's longest runway, allowing it to accommodate heavy long-haul aircraft. The airport is a major destination for leisure flights during the European summer holiday season. Yugoslav flag carrier Aeroput used a seaplane station in Dubrovnik to open the first routed linking the city. The first route was opened in 1936 linking Dubrovnik to national capital Belgrade via Sarajevo. Next year a route to Zagreb was inaugurated. But it was in 1938 that Dubrovnik saw a significant increase in air traffic, with the introduction by Aeroput of regular flights to Vienna, Brno and Prague with stops in Sarajevo and Zagreb, and also the introduction of a regular flight between Belgrade and Tirana with a stop in Dubrovnik. However, by early 1940s, with the World War II, Aeroput operations were suspended. Dubrovnik Airport opened in 1962. The city was originally served by the Gruda Airfield which opened for commercial traffic in 1936 and was in use only during the summer months. The domestic airline Aeroput linked Dubrovnik with Belgrade (via Sarajevo) first in 1936, and a year later a route to Zagreb was opened. During 1987, the busiest year in Yugoslav aviation, the airport handled 835,818 passengers on international flights and a further 586,742 on domestic services. Following the breakup of Yugoslavia, the airport surpassed the one-million-passenger mark in 2005. Today, Dubrovnik boasts the most modern passenger terminal in the country. A new terminal is being planned in place of the old airport building, constructed in 1962, which has now been demolished to make way for a new modern structure. The price tag of the project amounts to seventy million euros and is to be financed out of a loan from the European Bank for Reconstruction and Development. In May 2010 a new terminal opened stretching over 13,700 square metres. It has the capacity to handle two million passengers per year. The control tower at Dubrovnik Airport. Dubrovnik Airport consists of three terminal areas, A, B and C. The spacious new Terminal C was opened in February 2017 and became fully functional in April 2017 as it replaced Terminal A for all passenger departures including check-in and security check. The new terminal features check-in and commercial space stretching over 1,000 square metres, eight security lanes, a departure lounge with commercial and catering facilities, a premium lounge and restaurants. Furthermore, it boasts sixteen gates, two of which will be used for domestic flights and the remaining fourteen for international services. With an area of 24,181 square metres, the airport's annual capacity has increased to 3.5 million passengers. The Terminal A building has been permanently closed for passenger traffic and is now being used solely as a baggage sorting facility. The new Terminal C is located next to the existing Terminal B building which handles arriving passengers. The two have been combined into a single functioning unit. Future airport plans call for an extensive commercial zone and a four-star airport hotel, and long-term plans call for a new runway and the conversion of the existing runway into a taxiway. The airport can handle widebody aircraft such as the B747 and A350. "Đurovića špilja" is a pit cave located under the taxiway of Dubrovnik airport. There is also a wine cellar located inside the cave. ^ "World Airlines Directory". Flight International. 10 August 1944. p. 150. ^ "Statistika 1962 - 2016" (Microsoft Word Document) (in Croatian). Dubrovnik Airport. Retrieved 29 May 2017. ^ "Dubrovnik Airport opens new terminal". EX-YU Aviation News. Retrieved 2 June 2017. ^ "Air France expands seasonal routes from Paris CDG in 3Q18". Routesonline. Retrieved 2018-02-05. ^ "Alitalia S17 Short-Haul routes additions as of 01JAN17". Routesonline. Retrieved 2017-01-02. ^ "American Airlines Expands European Footprint and Modifies Asia Service". American Airlines. Retrieved 2018-08-21. ^ "Flight Only - Dublin to Dubrovnik". Croatia Tours. Retrieved 18 January 2019. ^ "Croatia Airlines adds seasonal Dubrovnik – Munich route in S18". Routesonline. Retrieved 2018-01-31. ^ "easyJet additional new routes in S18". Routesonline. Retrieved 2017-12-18. ^ "Edelweiss S18 short-/mid-haul changes as of 05JUL17". Routesonline. Retrieved 2017-07-06. ^ "flydubai announces new seasonal routes for summer 2018". flydubai. Retrieved 2017-11-29. ^ "Jet2.com Plans New routes in S17". Routesonline. Retrieved 2016-05-31. ^ "LEVEL Profile". IAG - International Airlines Group. 2 February 2018. Retrieved 28 June 2018. ^ "LEVEL launches Vienna service from July 2018". Routesonline. 2 February 2018. Retrieved 28 June 2018. ^ "LOT Polish Airlines adds Dubrovnik route from May 2018". Routesonline. Retrieved 2017-12-22. ^ "LOT Polish Airlines increases Krakow European network in S19". Airlineroute. 11 January 2019. Retrieved 11 January 2019. ^ "Ryanair To Launch New Dubrovnik And Split Services". Dublin Airport. 3 December 2018. Retrieved 3 December 2018. ^ Liu, Jim (7 November 2018). "Sun d'Or adds Tel Aviv – Dubrovnik seasonal route in S19". Routesonline. Retrieved 7 November 2018. ^ "Thomas Cook UK S18 New Short-Haul routes as of 06DEC17". Retrieved 2017-12-07. ^ "Transavia S18 Europe service changes as of 21SEP17". Routesonline. Retrieved 2017-09-22. ^ "Thomson outlines planned new routes in S17". Routesonline. Retrieved 2017-01-24. ^ "TUI Airlines Belgium adds new sectors in S18". Routesonline. Retrieved 2017-12-05. ^ "Volotea S18 new routes as of 28NOV17". Routesonline. Retrieved 2017-11-29. ^ "Volotea S19 new routes as of 12NOV18". Routesonline. Retrieved 2018-11-12. ^ "Volotea S17 New routes as of 14OCT16". Routesonline. Retrieved 2016-10-14. ^ "Wings of Lebanon Operations in 16Q3". Routesonline. 25 June 2016. Retrieved 31 March 2017. ^ "Statistics 1962–2010 (statistika.pdf)" (PDF). Airport Dubrovnik. Retrieved 23 June 2011. ^ "Statistics 1962–2010 (statistika.doc)". Airport Dubrovnik. Retrieved 23 June 2011. ^ "Airport Dubrovnik Top 13 Avioprijevoznika" (PDF). This page was last edited on 12 April 2019, at 10:33 (UTC).